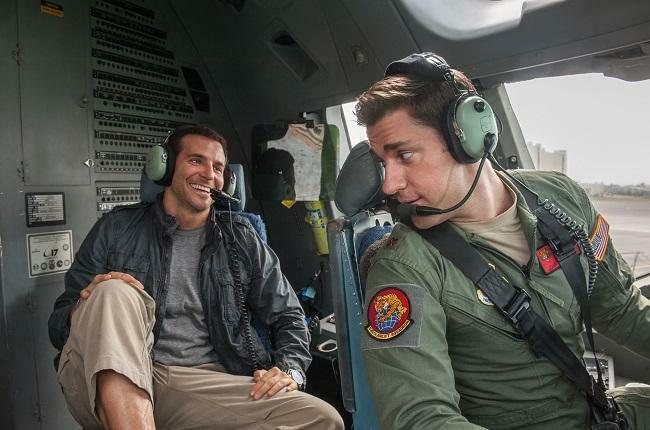 A celebrated military contractor (Bradley Cooper) returns to the site of his greatest career triumphs -- Honolulu, Hawaii -- and reconnects with a long-ago love (Rachel McAdams) while unexpectedly falling for the hard-charging Air Force watchdog (Emma Stone) assigned to him. Movie trailers can be very misleading. Some entice with a greatness that doesn't really exist. You get excited to see the movie, only to be disappointed by it not delivering the content that was advertised. Such is the case with 'Aloha.' The trailer advertised a should-be instant rom-com classic, but that's not exactly what we got. I'm a fan of Cameron Crowe. His writing speaks to me, so I spot some truly brilliant aspects to it. The movie itself contains all of the elements needed, but the final cut's rushed editing removes the accents, the emotional punches. Loving Crowe's work and knowing the pre-release troubles from former Sony head Amy Pascal, I blame the studio for its failures. 'Aloha' kicks off with a very fast and jam-packed introduction to Bradley Cooper's leading man character, military contractor Brian Gilcrest. Formerly part of the Army, he left to work for a very wealthy private contractor (Bill Murray). While the pursuit of a higher-paying job is no crime, this pre-narrative backstory shows his character's inability to be faithful to something that supported him and took very good care of him for years. Since then, he has crashed and burned. With a string of bad decisions hanging over him like a cloud, he jumps at the chance to take a new assignment that brings him back to Hawaii, the place where the most monumental years of his early career unfolded, the place where he let the love of his life get away, the place where the bad decisions all began. Without being said, it's obvious upon arrival that he hopes to find redemption along the way. Moments after landing, he finds himself in the awkward and uncomfortable middle ground between his past and his promising future. The sky is literally the limit, but without confronting the ghosts of his past, he's never going to get back on his feet. This is it - his final chance - and if he doesn't make the change now, it's never going to happen. Almost immediately, Brian runs into the ex-fiancee, Tracy (Rachel McAdams), that he selfishly hurt and abandoned a dozen years ago. You might expect the two to clash in cliche romantic comedy fashion, but Crowe doesn't write cliches. Instead, they bounce off one another as if still back in the good times of their relationship. It's obvious why the two were once an item and is apparent that neither is entirely over the other. As they converse and catch up, the world seems to stop around them. After a failed marriage to a vain woman (Elsa Pataky, who only appears in the 20-minute alternate opening of 'Aloha'), Brian is currently a single bachelor, but Tracy is married with two children. No one likes watching movies about cheaters. And although their dynamic and chemistry is strong, their actions never feel out of line. Instead, they come across as two adults who completely understand one another and embrace the nostalgia of their long-lost past. Brian is not in Hawaii to steal her away from her husband (Jon Krasinski) and Tracy isn't looking to cheat. Just after the Brian/Tracy reunion, we meet the latest of Crowe's classically lovable female characters, Allison Ng (Emma Stone). With Brian being a contractor working with the military, he's required to have a military liaison - or, babysitter - at all times. Being an amped-up up-and-coming go-getter fighter pilot, Allison seems to be the opposite of Brian's type - but there's something in her that he's quickly attracted to. It takes a short while for him to recognize it, but she possesses the same child-like wonder and passions that he himself used to have. If he's going to return to being the noble and the potential-filled man that he used to be, then he will need to re-adopt those characteristics. While he is slow to find that attraction, Allison sees it from the start. She sees the potential buried deep within Brian's character flaws. Once Brian is paired with Allison, the movie's fleeting plot kicks off. Brian's new job is to work with the king of Hawaii's sovereign nation to obtain his blessing on the land where a proposed military project will take place. It's surprising that so many people bitched and complained about the movie's lack of respect for the native Hawaiian culture because the king character is played by none other than the real king, Dennis "Bumpy" Kanahele. Bumpy actually blessed the film's production and played a huge part in capturing the native culture and lifestyle - but that's another controversy for another day. The main story comes and goes throughout the film. 'Aloha' jumps back and forth between story and fantastic intimate character moments that have nothing to do with the Bumpy plot. It's within the blending of the two that the movie's bad editing stands out. It's constantly rushing. We rush through the set-up so that we can get to the character drama, only to rush through that so we can get to the plot, only to rush once again to get to more brilliant character drama. It follows this speedy cycle over and over again. The nauseating pace and pattern kills the momentum. Being about the only person on the face of the earth to openly admit that 'Vanilla Sky' is one of my all-time favorite films, it's obvious that I'm a huge Cameron Crowe fan. I know how much his characters mean to him - anyone who has seen the "Untitled" cut of 'Almost Famous' knows that - and I'm certain that there are emotional swells that are missing from the final cut of 'Aloha.' Crowe is the type of surgical writer/director who takes his time to tell memorable and impactful tales about people who you fall in love with. Each character within 'Aloha' is rich. Each has at least one notable arch. But because of choppy and rushed editing, 'Aloha' feels like a 150-minute movie that was jammed into a studio-approved 105-minute runtime. I can't deny the flaws of 'Aloha.' At times, it's an utter mess, but it works well enough to get by - just not as well as it could have. The potential is there. It has everything that makes an iconic Crowe film: great characters, swells of emotion, a brilliant script, and quirky-yet-perfect shots of actors doing wonderfully eye-pleasing things. As a standard rom-com, it's better than most - but even the casual moviegoers can cite the problems. Sony has placed 'Aloha' on a Region A BD-50 disc and placed it in a blue vortex keepcase. Along with the physical copy comes a redemption code for an Ultraviolet digital copy. First run editions include a cheap cardboard slipcover that duplicates the artwork images. Two stickers are slapped on the slipcover – one for Ultraviolet, the other promoting the "alternate ending, cast gag reel and more!" – and can be removed easily without leaving a sticky residue. Lots of pre-menu content plays when you start up the disc, all of which is skippable: a Sony reel, a specs disclaimer and trailers for 'Ricki and the Flash,' 'Infinite Polar Bear,' 'Testament of Youth' and 'Insidious: Chapter 3.' Similar to the 'We Bought A Zoo' menu, that of 'Aloha' features creative artsy backdrops set to score from Jónsi and Alex. 'Aloha' arrives on Blu-ray with a solid 1080p/AVC MPEG-4 encode and a 1.85:1 aspect ratio. The film kicks off with very aged archival footage of Hawaii and rocket launches. The 1.33:1 imagery is highly flawed, but that's not how the narrative itself plays out. The final space-bound rocket launch video cleans up as it widens to the 1.85:1 ratio. The clarity and cleanness then lasts for the remainder of the film. If you've seen 'Into the Wild,' then you know the wonderful and natural look that director of cinematography Eric Gautier is capable of. The presentation of the 35 mm footage brings a quite a bit of celluloid grain with it – but not an overabundance. His documentary-esque style comes with a bit of movement, all of which manages to keep the focus racked and the sharpness intact. The sharpness of 'Aloha' is so crisp and clear that I questioned and double-checked that it wasn't shot with digital cameras. Fine details can be seen throughout. A few flies can be seen buzzing around the set that will leave you wondering how the actors can go on without swatting at them. Close-ups yield amazing facial qualities. The only times that details can appear hidden is when the bright Hawaiian sun washes them out. Gautier prefers natural lighting, so the Hawaiian sun can be blinding at times – by no fault of the disc's video quality. Following the film's climax, as Cooper and Stone exit a deep indoor setting and head for the outdoors, the natural lighting becomes a hindrance for the disc. The contrast had to be blown out to make it work. The result is a black level that's worn down and a slight amount of noise. Foprtunately, that's the only instance where Gautier's camerawork and lighting work against him. Soft focus is occasionally used to achieve a desired look for specific scenes, so don't assume that it's a disc flaw. Colorization is wonderful, but a specific scene dabbles on oversaturation that's also no fault of the disc. If you saw 'Aloha' in theaters, then you'll recall the great Officer's Club party scene in which Stone and Murray take to the dance floor. Beneath the vibrant dance floor lights, the near-oversaturation can be seen – but it's really not an issue. 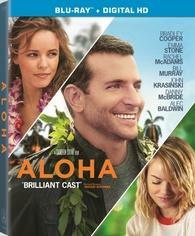 'Aloha' features a great 5.1 DTS-HD Master Audio track that places the emphasis on the right parts in the right moments. If you know Crowe's work, then you know that he constantly uses music to enhance and heighten his movie's emotion. 'Aloha' is no different. Dozens of tracks are put to use to add to his screenplay, the actor's performances and the cinematography. Music always rings out through all channels dyanmically and beautifully. The vocal mixing is just as solid as that of the music. It all kicks off with Cooper's voice-over that quickly sets up the character and story. The quality is solid, allowing the rich nature of Cooper's voice to shine through. (In Woody Allen fashion, his V.O. has a similar effect in the way that the narration sounds the same way that Crowe might have spoken the dialog.) No matter the background noise created by the settings nor the amount of heightened vocal levels, the dialog is always crisp and clear. Effects play a more subtle role in the mix, but they're just as effective as the other elements. When set on/near the military base tarmac, you'll hear jet engines – large and small – firing up and moving. When set near the jungle-ish forest, you'll hear the wind blowing through the trees, thunder rumbling in the distance, droplets of rain falling on surrounding objects, birds, bugs and more. And during the sound-filled climax, get ready for a fun slew of sounds to be thrown at you from all channels. If you know pop culture, it's like a series of aural easter eggs. The Untitled Hawaii Project: The Making of 'Aloha' Documentary (HD, 1:13:51) – This feature-length documentary is a fantastic demonstration of what went into 'Aloha.' Creative, artsy and informative, you'll catch a glimpse of the film's unmet potential. Gag Reel (HD, 6:26) – Like most gag reels, this one is pretty self-serving, although there are several great outtakes with Alec Baldwin. After rebounding with 'We Bought A Zoo,' Cameron Crowe's heavily-edited 'Aloha' isn't going to restore the faith of those who want to see him succeed again. Due to a hack-job of editing, 'Aloha' translates into pure fluff with the hearty content left on the cutting room floor. You don't need to be a film major to recognize that it's a two-and-a-half hour movie condensed into 105 minutes. Despite its faults, it's not as bad as most rom-coms. Video and audio qualities are perfectly fitting. The great imagery and framing are done justice by the high-def presentation. The audio – especially the music – swells just as strongly as any other Crowe film. The massive amount of quality special features offer insight into the greatness of 'Aloha' that didn't make it into the theatrical cut. I doubt that we'll ever get to see the movie the way it was meant to be told, but this fully loaded and good-looking edition will definitely suffice.